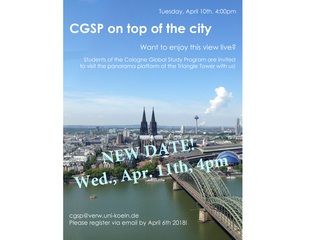 We recommend all CGSP students to attend our info session on March 8th! Have a look at the flyer for more details! Summer term schedule is online! Have a look at our summer term page for more details! 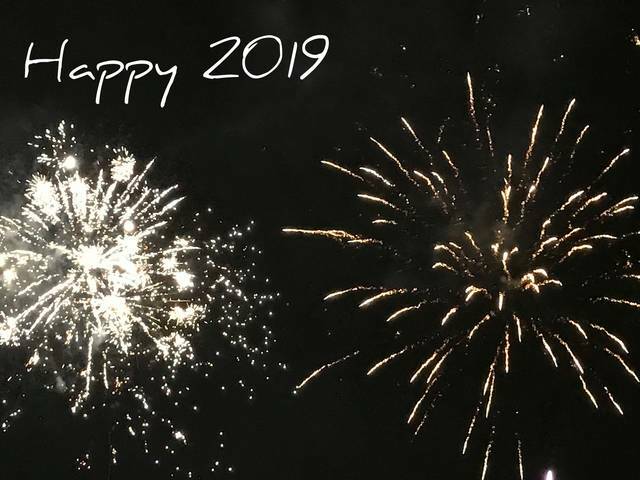 The team of the CGSP is wishing you all a Happy New Year! 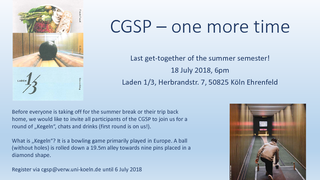 The team of the CGSP will be out of the office due to the Winter Break until January 3rd 2019. We are wishing you Happy Holidays and all the best for the upcoming New Year! Inviting all students of the CGSP to a traditional Kegel-event. This will be the last get-together of the summer term and we are looking forward to see many of you there! Please note: Due to the public transit strike in Cologne on April 10th, our excursion to the Triangle Tower will be moved to Wednesday, April 11th! Please re-confirm your participation or register for one of the last available spots via email! Courses will be published latest by February 5th 2018! For pre-liminary course information, please see the information provided on the page "upcoming semester" or check our pre-liminary schedule! 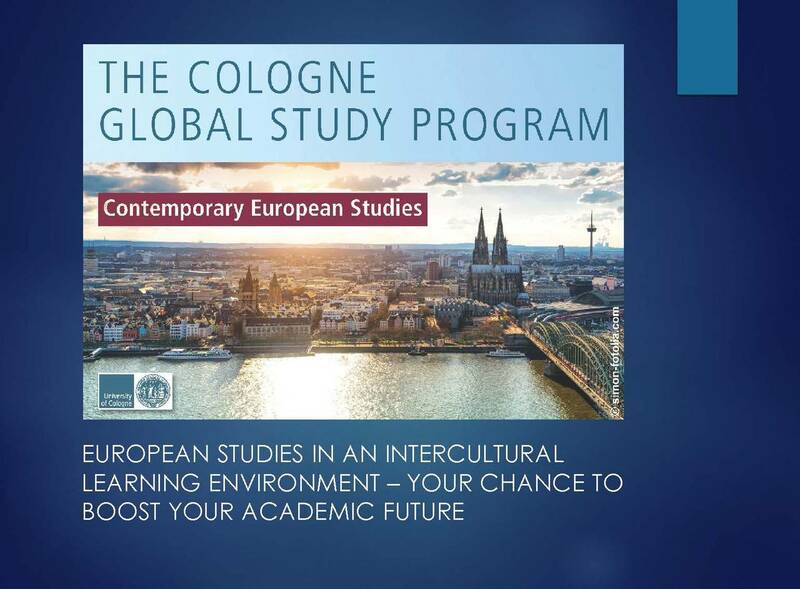 Find us on facebook @cgspUoC ! Brussels update: departure 7:30am on Nov 10th at the main train station! Due to a national holiday, the University (and all other public institutions and stores) will remain closed on Oct. 31st and Nov. 1st. The 3rd registration phase for our courses (core courses and "Intercultural Issues in Academia" will start on Wednesday, Oct. 11th 2017. The next Klips 2.0 registration period will start on August 30th! Pictures from the study trip to Brussel are online! The winter term 2017/18 course program for the CGSP is online!